'Missile with a Man in it'. That was the appellation given tothe F-104 when the media first got wind of it. And for good reason. It very muchlooks the part. Small wings and tail section, long fuselage, incredible powerfrom it's J-79 turbojet, and a small cockpit for the pilot. The F-104 was builtto a requirement for an interceptor. All other considerations were to besecondary to the need to get to the target as quickly as possible. NaturallyLockheed's Kelly Johnson was up to the task and built the smallest airframepossible around the biggest engine then available. The Starfighter was theresult. One of the innovations of the F-104 was the variable inlets thatmoved fore and aft to break down supersonic air into transonic air so that theengine could use it. This was so secret that 'falsies' were put over the engineintakes for the first series of photos of the plane. The wings were consideredrazor sharp so protective coverings were put on the leading and trailing edgesto protect the ground crew from any harm. With such a thin wing, there was noplace for the landing gear, so that was all contained in the fuselage. Asidefrom a 20mm cannon, the twin Sidewinder armament was carried on the wingtips. Naturally, the plane eventually got wing and fuselage pylons forfuel tanks and additional ordnance. 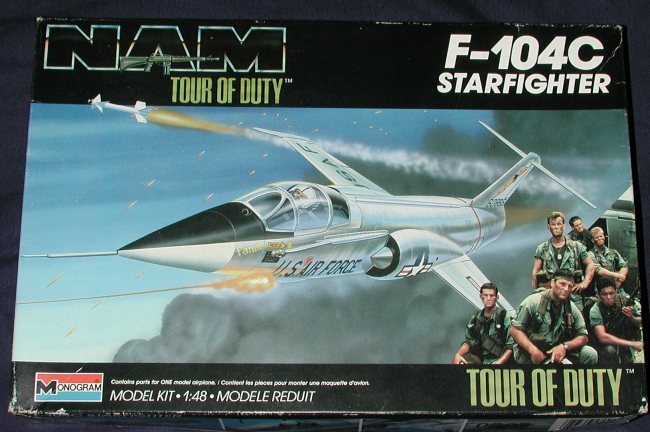 Though a tricky aircraft to fly, it was notoutside the capabilities of the average pilot and soon the F-104 was sold in thethousands to NATO and other countries. Even today, a few F-104s are still flyingin Taiwan and in the US with NASA and private hands. Italy still has a largenumber of the very much improved F-104S ASA version in service as aninterceptor. 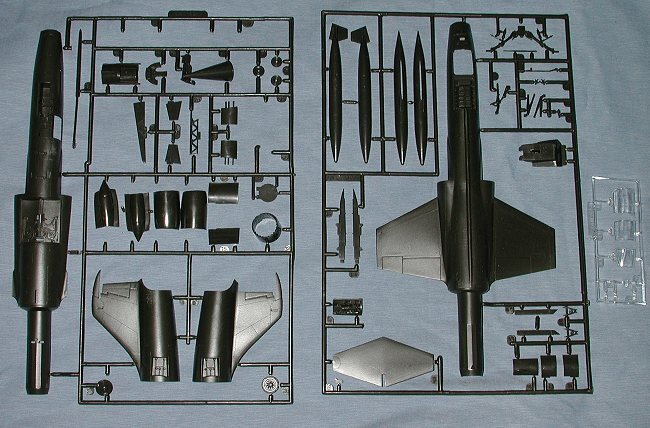 Monogram has released the F-104 both as a C model (this kit) anda G model with the larger fin and rudder. This kit is typical of Monogram'sCentury Series kits in 1/48. Superb detailing of the parts, raised panel linesand a nice pilot figure (not shown). Options include: open or closedcanopy, wing tip fuel tanks or missiles, refueling probe, and open or closedspeed brakes. Most photos show the 104 with the speed brakes closed on theground and with tip tanks installed. The fuselage is splithorizontally with the wings incorporated in the upper fuselage half. Thisassures proper wing anheadral. An interesting touch is the tailpipe as part ofthe fuselage assembly. The tail section itself is split vertically with the onepiece slab stabilizer fitting atop it. The instructions are amongst the best in theindustry giving clear construction steps and any colors needed shown duringthese steps. There are two possible camouflage options. One is for an F-104 inoverall aluminum with colorful markings from the 479th Fighter Group. The otheris a South East Asia camouflaged aircraft as was sent over to Vietnam to supplybase protection. The decals are very colorful and very glossy. Some folks havehad trouble with Monogram decals so it wouldn't be a bad idea to have someaftermarket ones around if needed. 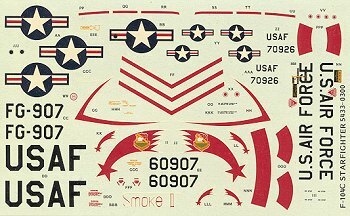 As nice as the Monogram kitis, it has recently been upstaged by an even nicer 1/48 F-104 from Hasegawa.However, the Japanese kit is more than twice the price of the Monogram kit. TheMonogram kit can usually be found for under $10 at swap meets and on-lineauctions. If you would like your product reviewed fairly and fairly quickly by asite that has over 2,000 visits a day, please contactme or see other details in the Note toContributors.